Gold, Platinum, Tajikistan Ruby and Diamond Ring. Estimate 35,000 — 45,000 USD. Photo: Sotheby’s. Set with a cushion-shaped ruby weighing 3.65 carats, flanked by two old mine-cut diamonds weighing approximately 3.30 carats, size 5. Accompanied by AGTA report no. 92029610 stating that the ruby is natural corundum, with no indications of heating. Accompanied by AGL report. no CS 65493 stating that the ruby is of Tajikistan origin, with no indications of heating. 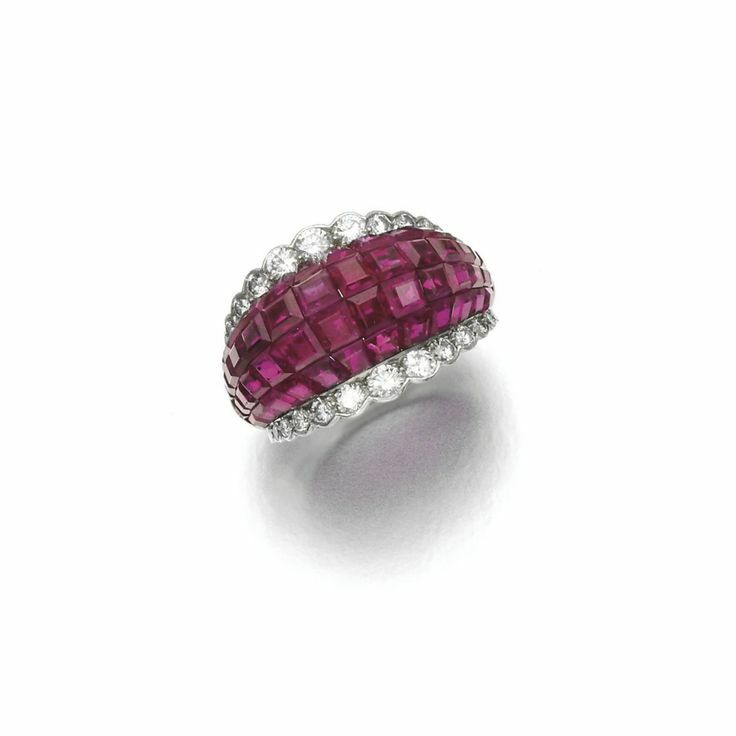 Of bombé design, the calibré-cut rubies en serti mystérieux, framed with circular-cut diamonds, size K, signed Van Cleef & Arpels, one ruby deficient. Accompanied by Gübelin report numbered 14066076/1 to 3, dated 12 June 2014, stating that the 5.02, 2.12 and 2.03 carat rubies are natural, Red colour, of Burmese origin, with no indications of heating; along with an appendix to report 14066076/1 to 3, stating that ‘Besides their well-matched appearance, they display high transparency and a richly saturated colour. The colour variety of the two heart-shaped rubies may be called « Pigeon’s Blood Red » in the trade…a set of three natural, non-enhanced rubies from Burma, endowed with such intrinsic qualities is rare.’; report numbered 13036128, dated 28 March 2013, stating that the 5.02 carat ruby is natural, Red colour, of Burmese origin, with no indications of heating; along with an information sheet to report 13036128, stating that the ruby is from Mogok, Burma; report numbered 12066025, dated 6 June 2012, stating that the 2.12 carat ruby is natural, Red colour, of Burmese origin,, with no indications of heating. This colour variety of ruby may also be called « Pigeon Blood Red » in the trade; along with a note to report no.12066025, stating that ‘Burmese rubies, especially the ones from Mogok, have since sustained the strongest renown….the natural ruby of 2.12 carat …possesses the properties of Burmese rubies from the areas described above »; report numbered 11076027, dated 13 July 2011, stating that the 2.03 carat ruby is natural, Red colour, of Burmese origin, with no indications of heating. This colour variety of ruby may also be called « Pigeon Blood Red » in the trade. GRS report numbered GRS2013-035165, dated 1 April 2013, stating that the 5.02 carat ruby is natural, Vivid Red (GRS type « Pigeon’s Blood ») colour, of Burmese (Mogok) origin, with no indication of thermal treatment; reports numbered GRS2013-071335 and GRS2008-071332, dated 8 July 2008, stating that the 2.12 and 2.03 carat rubies are natural, of Burmese origin, Vivid Red (GRS type « Pigeon Blood Red ». Red is an auspicious colour to the Orientals. There are myths and legends about people who wear rubies are blessed with flourishing romance, family harmony and longevity. The Shwedagon Pagoda in Yangon, Burma was liberally crowned with 2317 pieces of rubies upon its restoration. Ancient warriors of Burma were accustomed to embed a ruby into their bodies, symbolising victories, whereas in Ancient China, the wardrobe and headpiece of the emperors and the highest-ranking officials were adorned with a ruby signifying their distinguished positions during the Qing-dynasty. 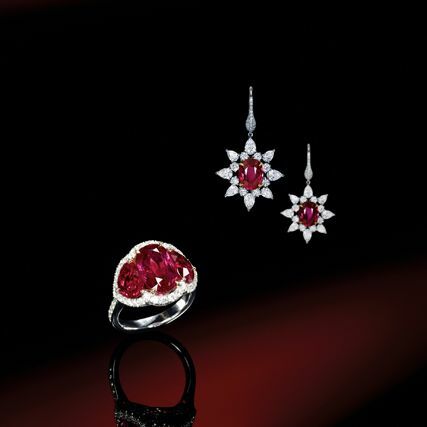 Since antiquity, rubies have an indispensable imprint in the history of royal jewellery collections across the world. 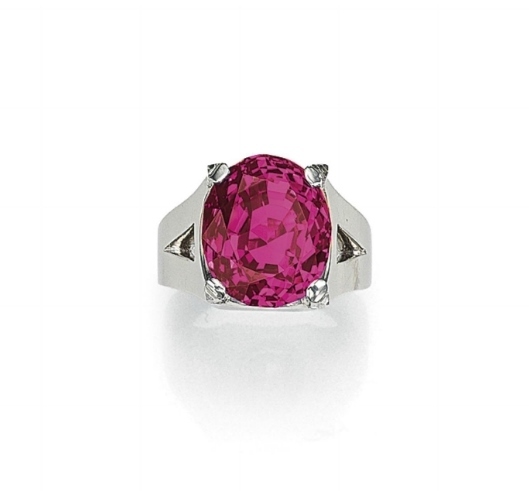 Natural rubies mostly originated in Asia, including Burma, Thailand and Sri Lanka as far as Africa and Australia. Among all, the valley of Mogok in Burma is the most fabled mine in the world. Rubies with true pigeon’s blood red colour is the most precious and treasured. American gemologist, Richard W. Hughes once mentioned, ‘…asking to see the pigeon’s blood is like asking to see the face of God’ in one of his books – A pilgrimage to Mogok – Valley of Rubies. 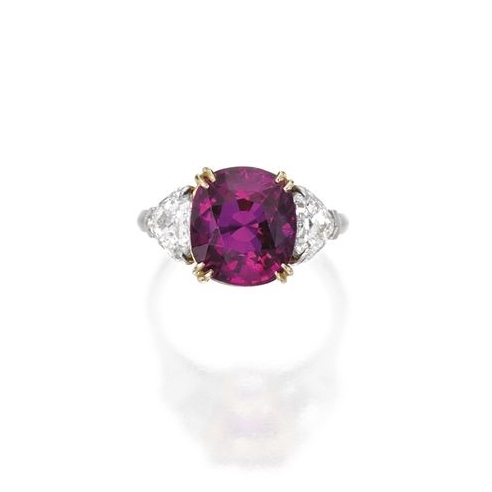 Continuous mining over the millennia has made natural rubies weighing over five carats extremely rare. Most rubies unearthed these days are then treated with heat for quality enhancement but they lost the genuine quality which Mother Nature has brought to our eyes. 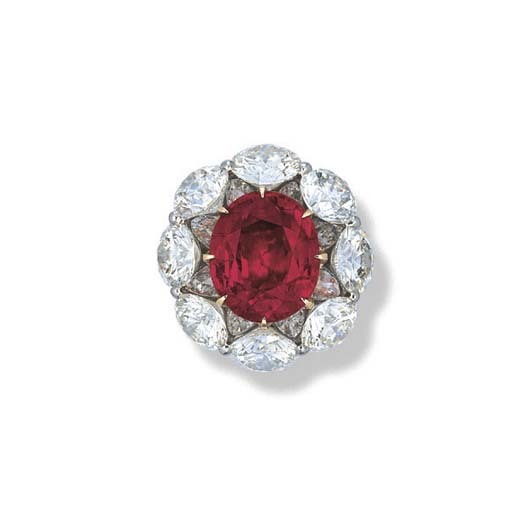 The cushion-shaped ruby weighing 14.45 carats, mounted within a surround of demi-lune and brilliant-cut diamonds, the shoulders similarly set, size 52. Accompanied by SSEF report no. 74970 and Gübelin report no. 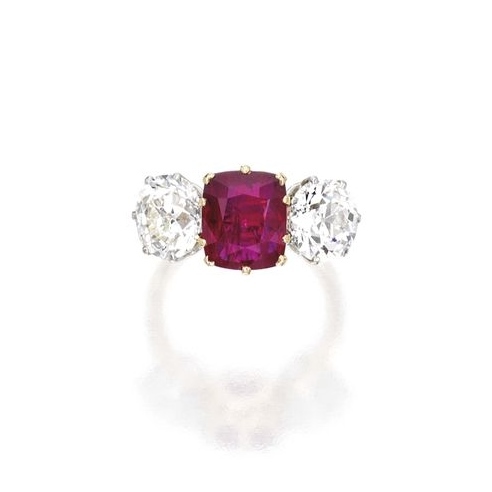 13120010, each stating that the ruby is of Burmese origin, with no indications of heating. « The described ruby exhibits a very remarkable size and weight of 14.450ct, combined with an attractive and beautifully saturated colour and a fine purity, rarely encountered in rubies of this size…. A natural ruby from Burma of this size and quality is very rare and exceptional » SSEF appendix letter, 6 June 2014. Geneva – Christie’s fall auction of Magnificent Jewels will be held on 11 November at the Four Seasons Hotel des Bergues in Geneva. Featuring over 390 lots, the auction includes top quality coloured and colourless diamonds, jewels of historical provenance, exceptionally rare gemstones, natural pearls and an important group of Jewels by JAR. 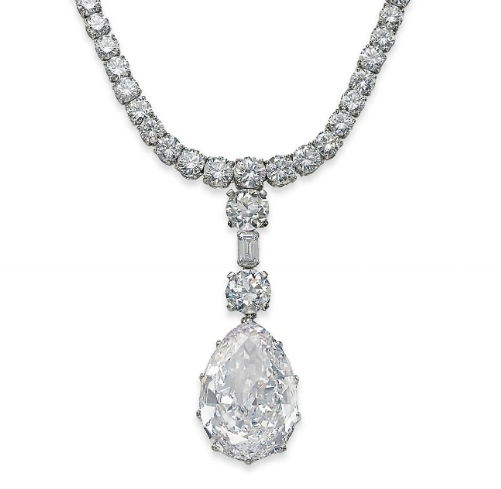 The auction is estimated to fetch in excess of US$80 million. 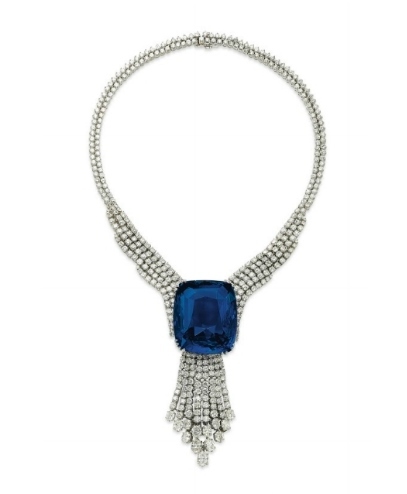 The auction is led by A Bulgari Masterpiece, a spectacular pair of pear-shaped coloured diamond ear-pendants, set with a 6.95 carat Fancy Vivid Blue diamond and a 6.79 carat Fancy Vivid Pink diamond which carry a pre-sale estimate of SFr. 11,500,000-14,500,000 / US$ 12,000,000-15,000,000. The sale will include the fourth largest faceted sapphire in the world, the Blue Belle of Asia, a cushion shaped Ceylon sapphire of 392.52 carats (estimate: SFr. 6,650,000-9,500,000 / US$ 7,000,000 – 10,000,000). This exceptional gem was discovered in 1926 at Pelmadula, Ratnapura (‘The City of Gems’) in Ceylon and was sold to British motor magnate Lord Nuffield (1877-1963), founder of Morris Motors Limited in 1937. The reasons behind his purchase of the Blue Belle of Asia have remained a mystery, however, it was rumoured that the sapphire was to be presented to Her Majesty Queen Elizabeth the Queen Mother, on her Coronation Day on 12 May 1937. Accompanied by report no. 72359 dated 2 September 2014 from the SSEF Swiss Gemmological Institute stating that the sapphire is of Ceylon origin, with no indications of heating, and a Premium Appendix stating that the sapphire ‘.. possesses extraordinary characterists and merits special mention and appreciation’. Report no. 14090018 dated 11 September 2014 from the Gübelin GemLab Institute stating that the sapphire is of Ceylon origin, with no indications of heating, an information sheet on ‘Unheated sapphires’ and an appendix stating that the sapphire ‘..is one of the largest faceted sapphires the Gübelin Gem lab has seen to date and possesses a combination of oustanding characteristics’. Notes: Many articles have been written on large sapphires in Royal and other important collections. Stones of over 100 carats will feature in several, but the quality and size of the present sapphire make comparisons difficult to find. An extract from the inventory of the Crown Jewels of Iran states that there are relatively few in the collection but three were worthy of special note, the largest weighing 191.58 carats. The Diamond Treasury in the Kremlin museum possesses a magnificent cornflower blue sapphire from the old Russian Royal regalia weighing 250 carats. 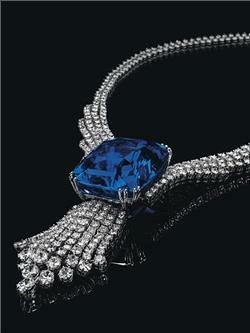 Another large Russian sapphire is one that bears the name of Catherine the Great and weighs 337 carats. From the very short list of faceted sapphires weighing over 350 carats, one has always remained a mystery. After the Blue Giant of the Orient (486.52 carats), the Queen of Romania’s Sapphire (478.68 carats) and the Logan Sapphire(423 carats), comes the Blue Belle of Asia, a legendary sapphire the history of which has been kept secret for a long time. This exceptional stone was discovered in 1926 at Pelmadula, Ratnapura (‘The City of Gems’) in Ceylon. Although it is difficult to locate information regarding the exact weight or shape of the gem at the time, it is often mentioned that it was ‘valued at 50,000’ in 1928, ‘weighing approximately 400 carats after having been cut and polished’. It had a ‘highly prized peacock blue colour and excellent clarity’ and was owned by the well-known gem and jewellery dealers Macan Markar in Colombo. The famous firm, established in 1860 by O. L. M. Macan Markar, had one of the most spectacular collections of gems and among their clients were several members of the British Royal family including HM King Edward VII and HM King George V.
In 1937, the Blue Belle of Asia was sold to British motor magnate Lord Nuffield (1877-1963). The founder of Morris Motors Limited, he was also an important philanthropist and in the 1920s, he had made his first substantial public benefaction. In 1937, Lord Nuffield founded and endowed Nuffield College, Oxford and in 1943 he gave 10 million to form the Nuffield Foundation. The trust was designed to benefit medical research, hospitals and education. At the time of his death in 1963, he had given away more than 32 million to charitable institutions. The reasons behind his purchase of the Blue Belle of Asia were mysterious. It was reported that the sapphire was to be presented to HM Queen Elizabeth the Queen Mother on her coronation day on 12 May 1937. The truth is that the Blue Belle of Asia ‘disappeared’ into private hands and that its location was unknown for the next 35 years. According to records from the 1970s, the famous Swiss based gem-dealer Theodore Horovitz had the opportunity to examine the sapphire. His notes and drawings give precious additional information on the shape and weight of the gem. It is now time for the Blue Belle of Asia to get the recognition it deserves. Sapphires of this size, colour and clarity are extremely rare. This magnificent specimen must rank as one of the most prestigious coloured gems to have come to the market for many years, worthy of any leading collection. An extremely rare ruby will also be offered for sale on November 11th: the Queen of Burma, an impressive Burmese ruby of 23.66 carats, mounted by Cartier (SFr. 5,250,000-6,650,000 / US$5,500,000-7,000,000). Purchased at Cartier in London in November 1937 by His Highness the Maharao of Cutch (1866-1942), the present example highlights once again the relationship between the European jeweller and Indian Royalty of that time. The Queen of Burma combines all the most sought-after qualities in a ruby: an attractive vivid pinkish red colour, an excellent purity, an impressive size and the finest origin. 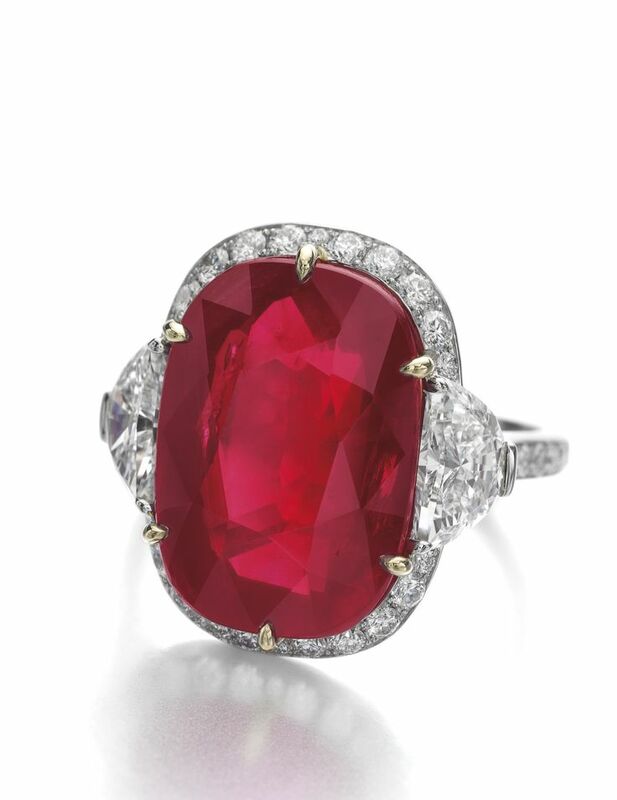 Notes: In November 1937, His Highness the Maharao of Cutch purchased an impressive ruby ring at Cartier London. The‘Queen of Burma’, as it is now known, is the perfect representation of the exquisite relationship between the European house of jewellery and Indian Royalty of that time. 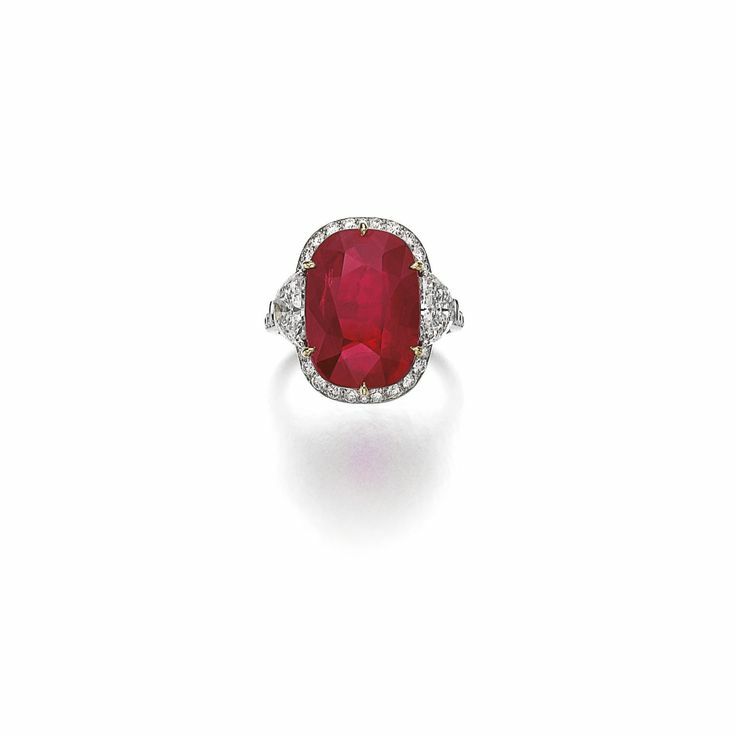 The ring is set with an extraordinary Burmese ruby, weighing approximately 23.66 carats, symbolizing the lavish life-style and connoisseurship of the Indian Maharajas. The setting illustrates the modernity and style of the period with simple and clean lines creating a strong and architectural ring for a gentleman. The novelty of the Art Deco style is exemplified further by four baguette-cut baton diamonds set backward on the prongs of the ring. The ‘Queen of Burma’ combines all the most sought-after qualities in a ruby, an attractive colour, an excellent purity, an impressive size, and the finest origin, making it an exceptional gem-stone. The gem connoisseur Mr. Richard W. Hughes, wrote on the subject: ‘Crystallized ruby is relatively common. But when rubies are found as fine, pure red translucent or transparent single crystals, they become some of the rarest minerals on the planet. As an advanced mineral collector I have only seen a handful that qualify as world-class ruby specimens and of those, only from Mogok (Myammar)’. The saturated red colour of the ruby is due to a combination of well-balanced trace elements in the stone, characteristic of the finest rubies from Mogok. The ‘Queen of Burma’ is exquisite for the purity of its crystal, showing almost no inclusions visible to the unaided eye. The ruby has been spared exposure to heat treatment and its colour and purity are thus all natural. The lack of enhancement further accentuates the rarity and prestige of this fine natural Burmese ruby. This exceptional stone could be compared with another exceptional gem, the ‘Hope Ruby’, a 32.08 carat cushion-shaped Burmese ruby and diamond ring by Chaumet, which sold for $6,742,440 against an estimate of $3,000,000 to $5,000,000. 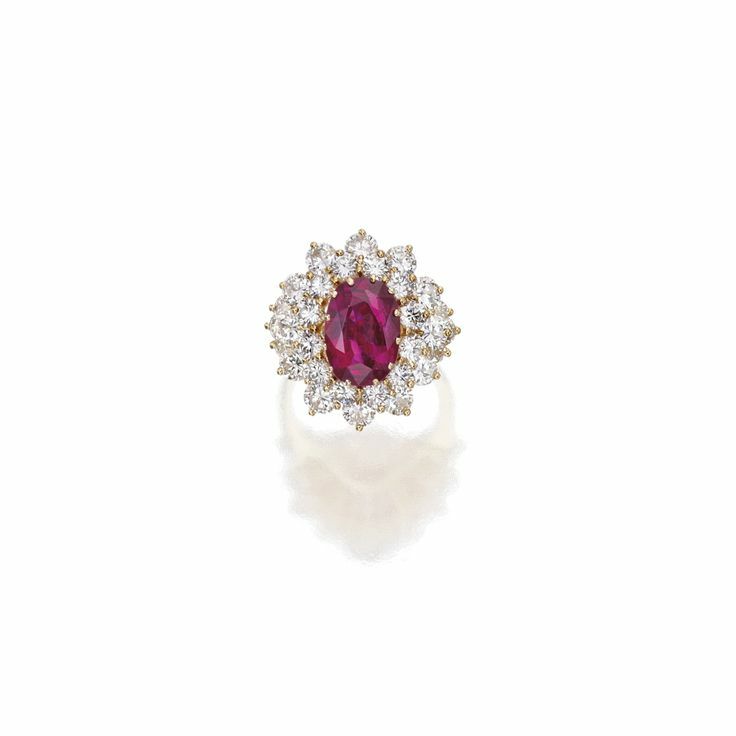 This world record price for a ruby at auction was part of the charitable Lily Safra sale, at Christie’s Geneva, in May 2012. 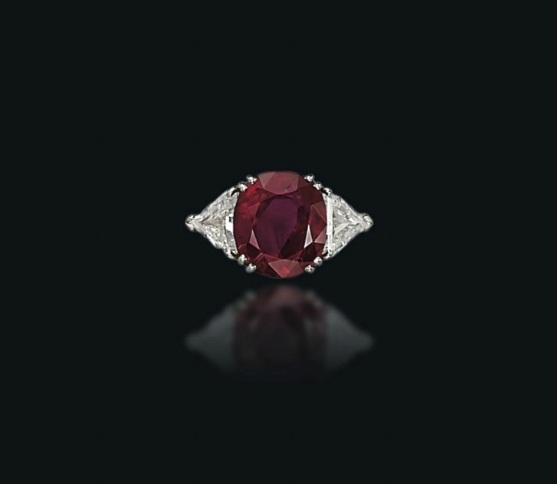 Like many prodigious stones, the ‘Hope Ruby’ was formerly in the collection of great personalities, such as Luz Mila Patio, the Countess du Boisrouvray. Such important pieces attract the most knowledgeable and refined ownerships, as the ‘Queen of Burma’ was once in the possession of the honorable Maharao Shri Khengarji III. His Highness the Maharao Shri Khengarji III (1866-1942) balanced his life between modernity and heritage. An educated man, he often travelled to Europe, where he cultivated and cherished high political and personal relationships. During his very long reign, from 1875 to 1942, the Princely State of Cutch flourished and grew through the implementation of many developmental initiatives such as education and health systems. The ruler recognized the extraordinary value of the ‘Queen of Burma’ when he acquired the ring from Cartier, in 1937. Meanwhile, Jacques Cartier had developed a great interest for India, travelling frequently to the subcontinent, visiting many of its regions, and establishing real friendships with several ruling Maharajahs. India, with its history and culture of jewellery and beauty, offered a new market for the trade of stones as well as a great source of inspiration with different cuts and association of colours. The relationship between Cartier and India was officialised in 1901 when Pierre Cartier was called to Buckingham Palace to create jewels of Indian inspiration for Queen Alexandra, Queen of England and Empress of India. The two countries intertwined histories was an opportunity for the jewellery house to fashion fabulous creations for the Royal family, influencing the style and the legacy of the time. The marriage of Cartier’s savoir-faire and India’s extraordinary heritage produced other wonderful jewellery pieces, such as the famous Patiala necklace, for the Maharaja Bhupinder Singh and the Art Deco emerald and diamond necklaces of the Maharajah of Nawanagar Ranjithsinhji, made by Cartier, respectively in 1928 and 1926. The splendour and opulence of the Maharajah era in collaboration with the renowned house of Cartier lives on in the ‘Queen of Burma’. 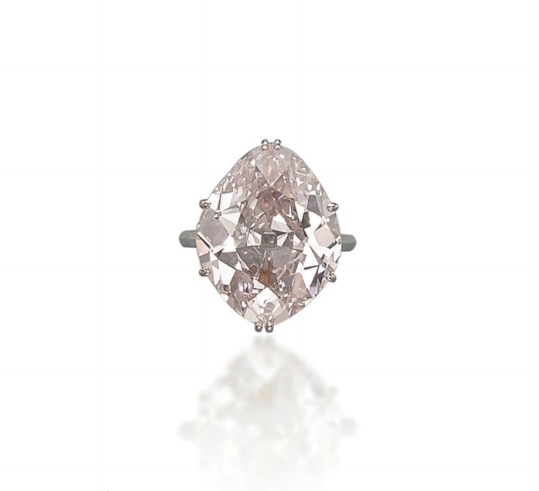 Following the sale of THE ORANGE in November 2013, which achieved a world auction record for an orange diamond (SFr. 32,645,000 / US$35,540,612) and the WINSTON BLUE in May 2014, which established a world auction record price per carat for a blue diamond (SFr. 21,445,000 / US$ 23,795,372), the November 11 auction of Magnificent Jewels will include A Bulgari Masterpiece set with a truly unique pair of pear-shaped coloured diamonds. This pair of ear-pendants, one set with a Fancy Vivid Blue and the other with a Fancy Vivid Pink diamond of nearly matching size is expected to fetch in excess of SFr. 11.5 million / US$ 12 million. 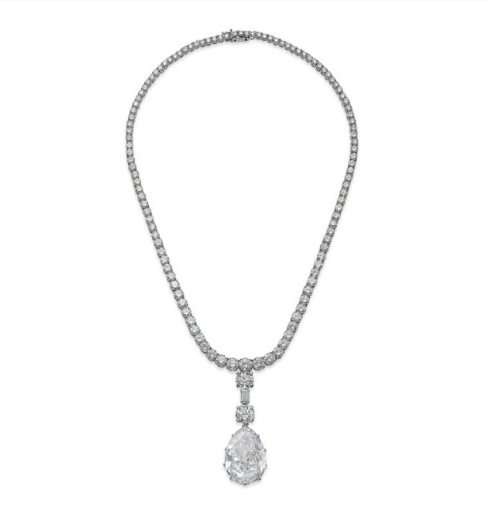 Additional highlights include a pear-shaped Very Light Pink diamond necklace of 40.48 carats (SFr. 3,250,000-5,250,000 / US$3,500,000-5,600,000 millions) and an old mine cut Fancy Pink diamond ring of 15.62 carats (SFr. 2,400,000-3,400,000 / US$ 2,500,000-3,600,000). Seven jewels by JAR will be offered at auction in Geneva, some of which were recently on display at the ‘Jewels by JAR’ exhibition at the Metropolitan Museum of Art in New York (Nov 2013-March 2014). The defining characteristic of Joel Arthur Rosenthal’s work is his superior craftsmanship evocative of the quality of jewels in the 18th and 19th centuries. Bold in proportion and often resulting in sculptural objects, his propensity for incorporating unusual gemstones into his creations give the works a vivid sense of movement and light. This was the first time that the Metropolitan Museum exhibited works of a contemporary jewellery designer. 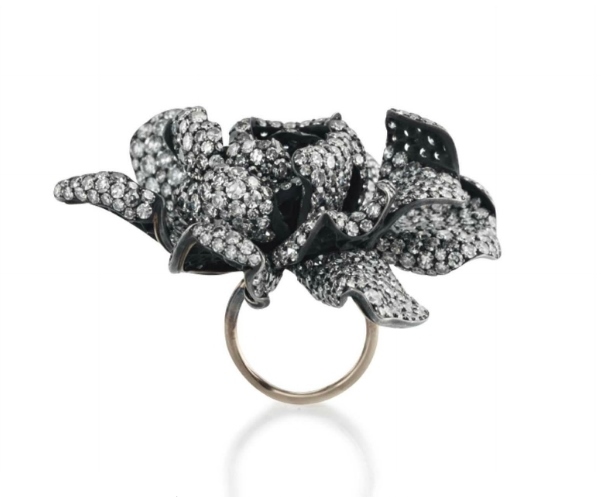 Amongst the remarkable group of jewels offered for sale are the ‘Gardenia’ ring, formerly in The Collection of Ellen Barkin (SFr. 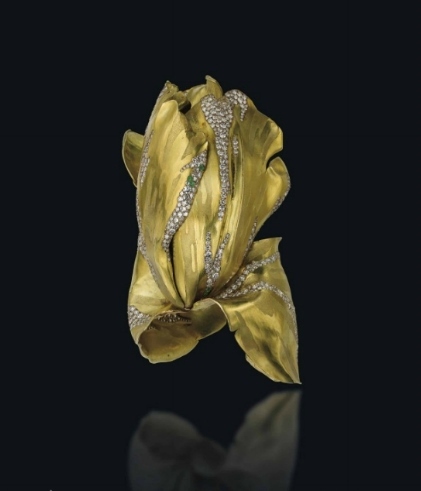 310,000-370,000 / US$ 330,000-390,000), the sculpted gold Parrot Tulip cuff (SFr. 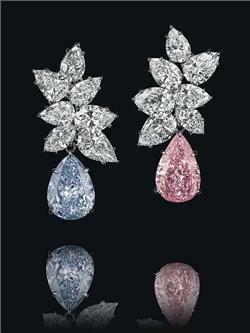 190,000-290,000 / US$ 210,000-310,000) and a pair of diamond ‘String’ ear pendants (SFr. 125,000-185,000/US$ 140,000-200,000). 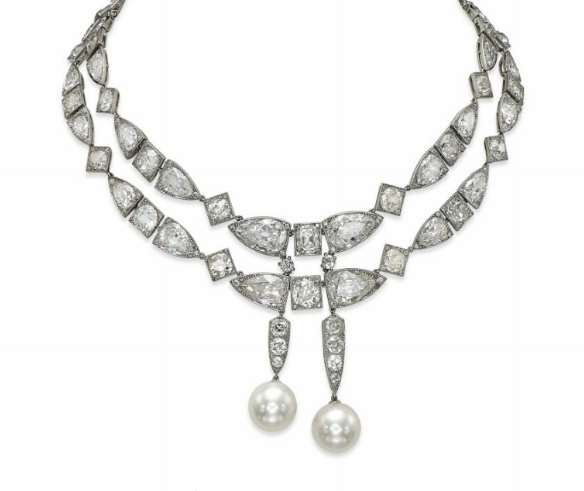 Formerly in the collection of Baroness Edouard de Rothschild, an Art Deco diamond necklace suspends two natural pearls of great quality and exceptional luster, measuring 16.0mm each (SFr. 670,000-950,000 / US$ 700,000-1,000,000). A pair of perfectly matched pearls of this size and quality are near impossible to find and will make a great addition to any jewelry collection. 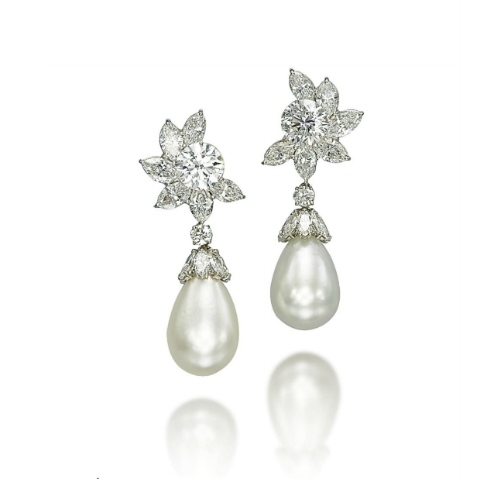 The sale will also feature a pair of diamond ear pendants with two magnificent drop-shaped natural pearls weighing more than 100 grains each (SFr. 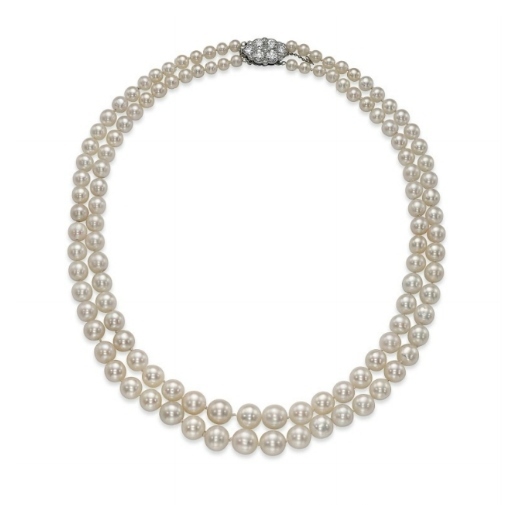 2,650,000-3,300,000 / US$2,800,000-3,500,000), and a two-strand natural pearl necklace of the finest rosé overtone quality by Cartier (SFr. 500,000-800,000 / US$530,000-850,000). The mythical ‘Feuilles de Groseillier’ brooch (estimate: SFr. 1,900,000-2,900,000 / US$2,000,000-3,000,000), commissioned in 1855 by Empress Eugenie (1826-1920) to French jeweller Alfred Bapst was part of one of the most beautiful parures of the 19th Century. It belonged to the French Crown Jewels, of which very few examples in original condition survive to this day. It is therefore extremely rare for a jewel of such historic importance to be offered for sale. French Crown Jewels auction, 12-13th May 1887, part of lot 11, purchased by Tiffany & Co.
Notes: Married to Napoleon III in 1853, Eugnie de Montijo (1826-1920) was the last Empress of France. A woman of great elegance, beauty and charm, she was born in Granada, Spain, was educated at the fashionable convent of the Sacr-Coeur in Paris and contributed immensely to the grandeur of the French court, overcoming her many critics of the time. She was also the leader of European fashion, and together with Charles Worth, developed a whole new range of fashion, which was soon followed by the rest of Europe. Along with her elegance and splendour, her intelligence was highly regarded. She acted as Regent during her husband’s absences from France and was regularly consulted on important questions regarding the welfare of the Empire. From the beginning of her reign in 1853, Empress Eugenie did much to enhance the reputation of French haute joaillerie, which at that time supplied the whole of Europe. Her love of jewellery being legendary, she had many Crown jewels remounted to suit her personal taste but also ordered some new pieces from the most famous jewellers in Paris. Her infuence on jewellery has been so important that many of her personal jewels are now referenced as ‘Famous jewels’: the pearl and diamond crown by Lemmonier, the ‘Croix des Andes’ emerald pendant, the diamond Sévignébow brooch by Kramer and, of course, the mythical Parure de feuilles de groseillier, by Bapst. This magnificent set was commissioned to Alfred Bapst in July 1855 and is still considered one of the most beautifulparures of the 19th Century. Composed of a guirlande (worn as a necklace), a tour-de-corsage (worn directly on the dress) and a devant-de-corsage brooch, its design was inspired by the delicate currant leaves and entirely set with diamonds. The choice of the famous Parisian firm of Bapst was no surprise. The Bapst family had been Court jewellers for already 200 years at the time, starting with Georges-Michel Bapst, made ‘Court Goldsmith’ in 1770. Since then, generation after generation, they had been the jewellers of the Royalty and safe keepers of the Crown Jewels. During the Second Empire, Empress Eugenie favoured their very subtle ornaments in the form of foliage from which hung aiguillettes orpampilles: the present brooch being one stunning example of the exceptional quality of Alfred Bapst’s designs executed by Frédéric Bapst. Following the fall of the Second Empire and the advent of the Third Republic in 1870, Empress Eugenie and her husband moved to England. Nearly all of their jewels were sold during a 12-day auction the French government conducted from 12th to 23rd of May 1887, and only a few of them survived in original condition. Several of the larger items were broken up before the auction so the stones could be sold individually. The Parure de feuilles de groseillierwas dismantled and sold as different lots. The guirlande was sold as 8 parts in lot no. 11. The present brooch was purchased by Tiffany & Co., who was the largest buyer at this legendary auction. A few years later, with the advice of famous American jeweller Paul Flato, the brooch was selected by the Metropolitan Opera of New York as a farewell gift to famous opera singer Lucrezia Bori (1887-1960). A Spanish soprano who had sung at La Scala in Milan, Madame Bori made her debut at the Metropolitan Opera in 1910, singing the title role of Puccini’s Manon Lescaut. Since then, and for more than 20 years, she appeared 654 times, singing the leading role in 39 operas, also acting as a fundraiser since 1932. Her immense contribution to the Metropolitan Opera and famous portrayals as Mimi in ‘La Bohème’ or Violetta in ‘La Traviata’ led her to be the first performer to be elected to the Board of Directors of the Metropolitan Opera Association. 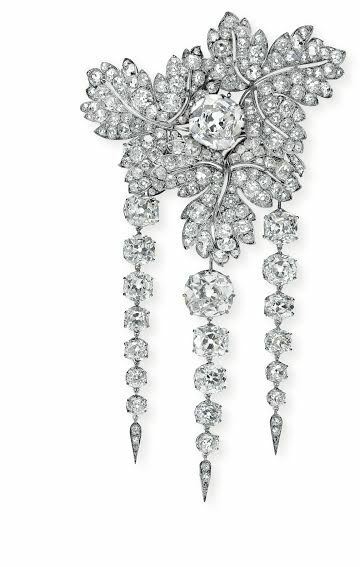 On the night of her farewell gala, the 29th of March 1936, the ‘Feuilles de groseillier’ brooch was presented to Madame Lucrezia Bori by Mrs Vincent Astor, in the name of her colleagues on the Opera board and a large group of friends. Deeply touched by the prolonged cheering and numerous tributes, Madame Lucrezia Bori thanked everyone and said ‘My heart is in such turmoil that I do not know how to express the varied emotions I am feeling. I am supremely happy, supremely grateful, and yet supremely sad. Au revoir.’. A devoted member of the Board of Directors, Madame Lucrezia Bori continued to work actively for the Metropolitan Opera until her death in 1960 and in her will, she bequeathed the brooch to the Metropolitan Opera where it has been exhibited since. 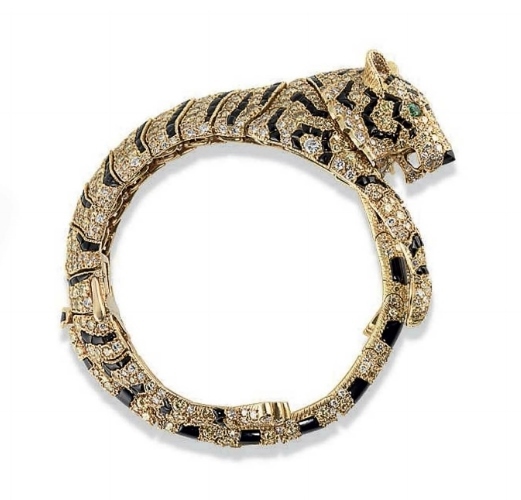 Formerly in the legendary collection of the Duchess of Windsor, a Tiger bangle and brooch by Cartier, now the property of Sarah Brightman, are two of the best examples of this iconic design created in 1928 by the famous French joaillier. The two jewels are offered as one lot with a pre-sale estimate of SFr. 1,700,000-2,400,000 / US$1,800,000-2,500,000. Parts of the proceeds will benefit The Andrew Lloyd Webber Foundation. By virtue of their unique history, Sarah Brightman intends to offer a portion of the proceeds from the sale to The Andrew Lloyd Webber Foundation, which significantly supports the arts, music in schools, The Architectural Heritage Fund and awards 30 performing arts scholarships annually. This donation will ensure the causes they both support benefit from the sale. Notes: In 1914 the big cat motif entered the Cartier family by means of an onyx-spotted panther pattern wristwatch created by the famous designer Charles Jacqueau. 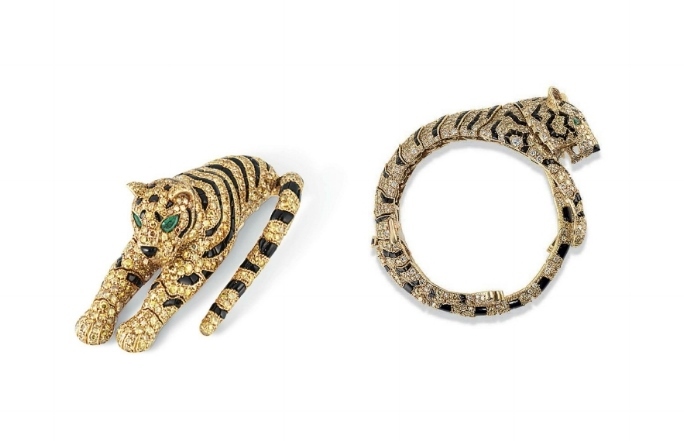 Through the years, the initial pattern has evolved to fully sculptured animals and the array of cats has widened to include the striped tiger as well as the panther, with the first naturalistic brooch being produced in 1928; now in the Cartier Collection. Already an important client of Cartier, the Duchess of Windsor immediately fell in love with these cat jewels; the first three-dimensional panther being commissioned for her in 1948. Surmounting a cabochon emerald, this gold panther was joined one year later by an iconic brooch featuring a sapphire-spotted panther, this time in platinum, with adjoining large cabochon sapphire weighing more than 152 carats. 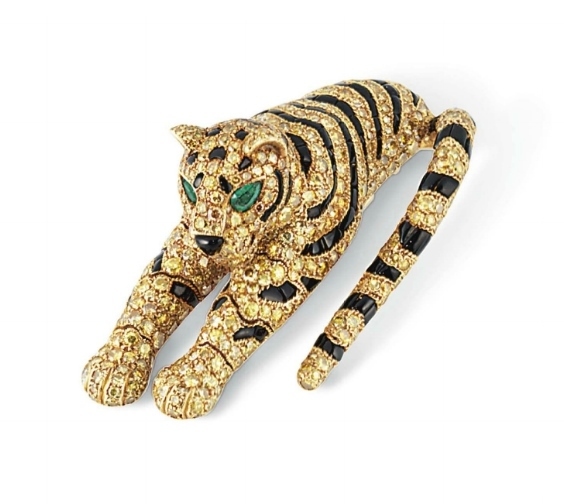 This legendary brooch had such a great impact on the style icons of the day that many adopted Cartier cats as their emblem. Daisy Fellowes and Nina Dyer, for example, both appropriated this new look. American heiress Barbara Hutton, notable style rival of the Duchess of Windsor, was also famous for her preference for Jeanne Toussaint’s tiger menagerie. The first of the Duchess of Windsor’s tiger themed jewels was a pair of lorgnettes, the hinged fold-out glasses concealed behind a tiger’s body, purchased in 1954 and soon followed by this tiger bracelet in 1956 and matching clip in 1959. An avid collector and one of the most stylish women of her day, the Duchess of Windsor amassed one of the most remarkable jewellery collections of the 20th Century. Her refined taste and ‘avant-garde’ spirit led her to acquire a combination of both classic and modern jewels. After her death, the collection was sold to benefit the Pasteur Institute in 1987. The Duchess of Windsor’s collection, including this bracelet and brooch, attracted international connoisseurs and although at the time buyers remained anonymous, it didn’t take long before the famous ‘Tigers’ were under the spotlight again. On 26 January 1988, Sarah Brightman, arrived with then husband Andrew Lloyd Webber at the opening party of « The Phantom of the Opera » at the Beacon Theatre in New York adorned with these tiger jewels. 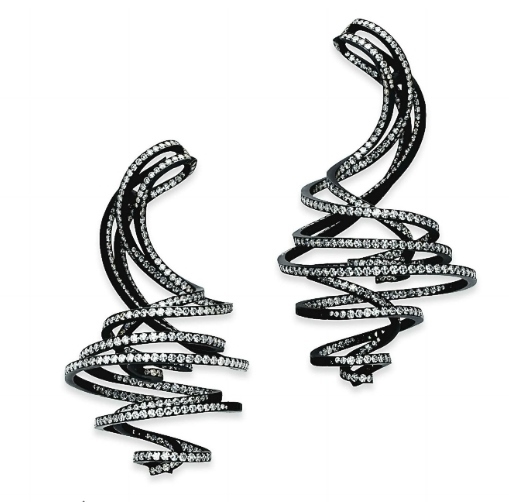 Andrew Lloyd Webber bought these iconic jewels for Ms. Brightman, as a present in celebration of the huge London and Broadway success of the musical, which he wrote and in which she starred. « The Phantom of the Opera » still remains the most successful musical of all time. After many successful years on the musical stage, Sarah resumed her music career and today, remains one of the most prominent performers, with global album sales of over 35 million. In 2012, Sarah became a UNESCO Artist for Peace Ambassador. Through this, and other humanitarian roles, Sarah advocates education for the role of women in science and technology. Accompanied by AGL report no. CS 56551 stating that the ruby is of Burmese origin, with no indications of heating. A natural pearl, ruby and diamond ring, circa 1930. Photo Bonhams. Accompanied by a certificate from The Gem & Pearl Laboratory stating that the pearl was found to be natural and of saltwater origin. Certificate number 03562, dated 22nd December 2010.